A movie must be pretty damn entertaining if you get a large drink, have it all gone mid way through the film and immediately have to go the bathroom but hold out for the next forty-five minutes because you honestly don't want to miss a thing. Saying that, my bladder was really happy the movie finally ended, but me, I was just glad this turned out to be such a thrilling, entertaining ride. In saying that, I have never seen the original 80's version of the flick, but I can guess how it went from seeing this updated version and I would no doubt have enjoyed this version anyway simply because of my generational expectations for films and enjoying the work of the actors involved here. As Jerry, Colin Farrell continues to step in the right direction in making a mainstream comeback. Jerry is a breed of vampire that is hard to kill and even harder to get along with, just ask Charlie Brewster (Anton Yelchin) who Jerry just happens to move in next to in . 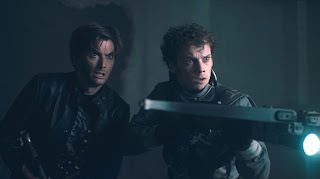 Now, I am definitely not hopping on this whole vampire train, but I gotta give credit where credits due and the 2011 "Fright Night" is nothing short of a good time at the movies. It's smart, funny, and with such a well-rounded cast the cheese never comes off as if the movie is making fun of the concept, instead we get subtle winks and nods that they're in on the joke but don't let it interrupt how much fun they're having. Happy to report that we don't either. 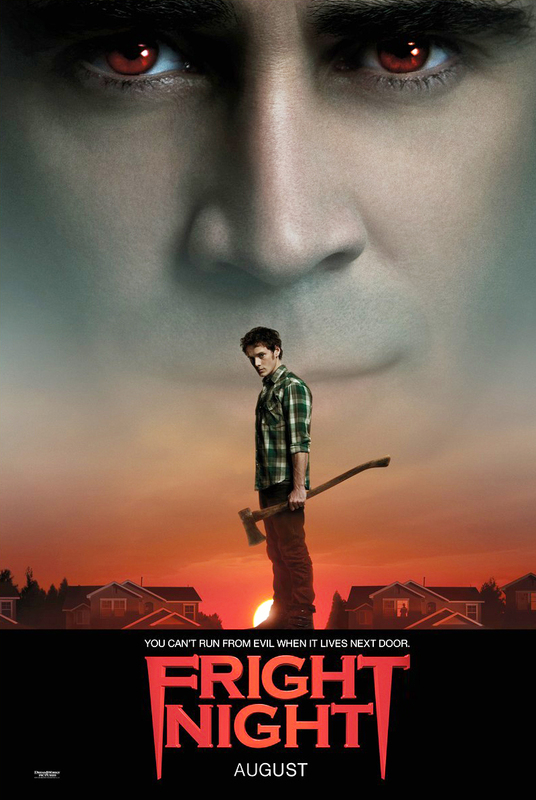 are friends turned enemies in "Fright Night". The story goes as such, Yelchin, who looks a little to mature to still be playing Charlie Bartlett is a geek at heart who has somehow managed to capture the affection of the hottest girl in school Amy, embodied here by Imogen Potts. he has shunned his old friends, mainly Ed (Christopher Mintz-Plasse) and has taken up with the tools who run the school so as to impress Amy. He lives with his mother (Toni Colette), his father nowhere to be seen and that's when you cue the new neighbor. Jerry seems normal enough at first, given he looks like Colin Farrell, but it soon becomes apparent that Jerry is not all he appears to be. In an early scene where Yelchin and Mintz-Plasse break into one of their friends houses director Craig Gillespie sets the mood and overall tension the movie holds. While there are plenty of moments here that you find yourself biting your nails and laughing out loud it is also balanced by the fact that this is a film that finally makes us feel as if all those other entertainment pieces based off the blood suckers are just a bunch of bologna. Now, I haven't seen the what looks to be smarmy take on the genre that is "True Blood" or the "Twilight" TV series "The Vampire Diaries" but I've seen enough "Twilight", "Underworld", and "30 Days of Night" to appreciate "Fright Night" for what it is: a relief. memorable impression on his new neighbors. For me though, what made "Fright Night" a real bit of fun was the combination of genuine vampire lore and the way in which it did look at the label the genre has garnered itself. This is done by introducing Peter Vincent, a Criss Angel type figure, who is a Vegas showman and rumored vampire expert. 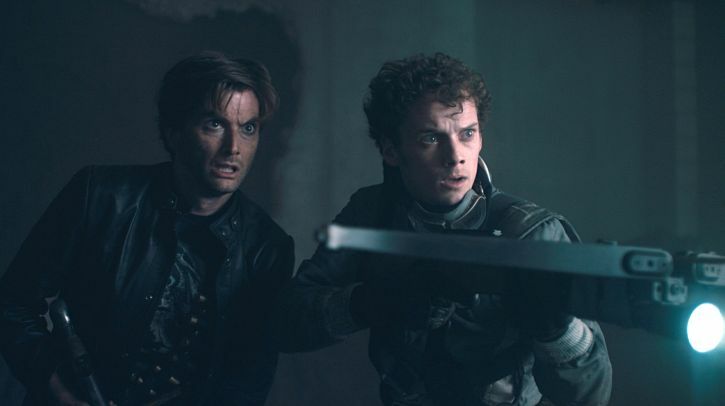 Yea, that sounds like it might be pushing it a little too far, but it offers our main characters an insight into the world of the ridiculous and as played by British actor David Tennant who most will recognize from Harry Potter, he is a well rounded character that is vital to the follow through of the story. Going in, I had no idea as to where this film might take me so there was a level of excitement to the endeavor and even though my expectations weren't reasonably high I felt I could count not only on Farrell, but his credible supporting cast to make a wise judgement in terms of script. The story may end up going where we expect it to but there are enough little quirks thrown in as well as honest performances that the movie is never dull. Yelchin anchors the movie with his likeability but it is Farrell who is no doubt the real star here. He isn't playing it over the top and he doesn't get all Edward Cullen on us either. He is a solid, quiet figure. He sniffs the air for his prey and wipes blood from his smeared lips as if it were nothing. He enjoys the rush of being invited into a guests home and he is so confident in his tactics we never feel anything close to fear from Jerry. He gets by with the whole gig by investing in a house located in the generic subdivision located right outside the Vegas strip. blacking out his windows because he works on the strip at night and so must sleep during the day. It is little touches such as this that make you smile, make you believe the writers of this update really wanted to add a sense of reality to a character that has, by this point, been so far up-rooted from its original incarnation people would now see Nosferatu as a parody. defeat Jerry by any means necessary. 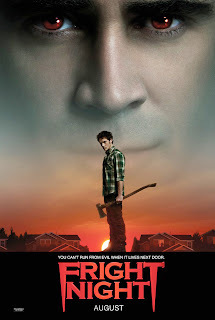 Though this summer movie season might feel like it is dragging to a close, "Fright Night" only adds to the final resurgence that has become apparent with films like "Rise of the Planet of the Apes" and "The Help" making strong marks with critics and average movie goers. This remake might not have the broad appeal of those films or the built in audiences but I hope there is still enough faith in movie-goers that there can be fun and original stories still told using the whole "vampire" plot point. "Fright Night" certainly deserves an audience but I wouldn't be the least bit surprised if this ended up being a bigger hit on DVD than it will at the box office. It is an R-rated fright-fest that doesn't overdo the gore or linger to long on any certain storyline. it moves along at a brisk momentum and charms us in a way that kept me at least fully engaged as my bladder could attest to. I didn't bother seeing the film in 3-D as their seemed no reason to really, although there were clear moments where the technology seemed to be put to creative use. Regardless, this was an enjoyable romp for a film fan who isn't even into the whole vampire craze so if you're in the club or out it doesn't seem you can go wrong as long as you're looking for solid entertainment. And who's not in the hot summer days of late August? Jerry sure is.